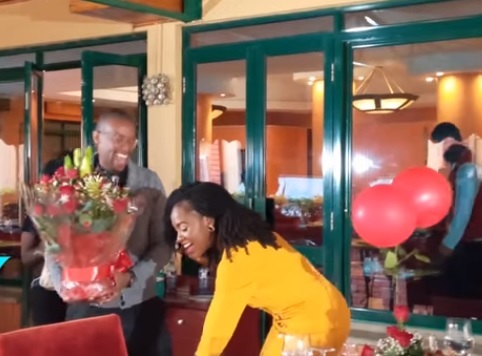 Thursday, February 14, 2019 - Citizen TV presenter, Wahiga Mwaura, has left ladies dying of envy after he interrupted a live broadcast just to surprise his wife, Joyce Omondi, on Valentine’s Day. Joyce, who is a celebrated gospel singer and budding TV host, was about to conclude her show dubbed ‘Full Circle’ on Switch TV when Wahigwa walked in carrying red roses and other gifts. Her reaction when she turned and saw her husband is just priceless. Clearly, she was caught by surprise as she giggled like a teenager in love while Wahiga hugged her. The two celebrities have been married for three years and it is apparent that they are still madly in love.